I’ve been attending comic and sci-fi conventions for a few years, actually since before I got deep into astronomy. It occurred to me last year (2013) at ECCC that there would be a large overlap of the convention attendees that would be interested in Astronomy. NASA actually had a large booth setup at that event, which really got me thinking about this. Well, last weekend, I was able to test out the idea. 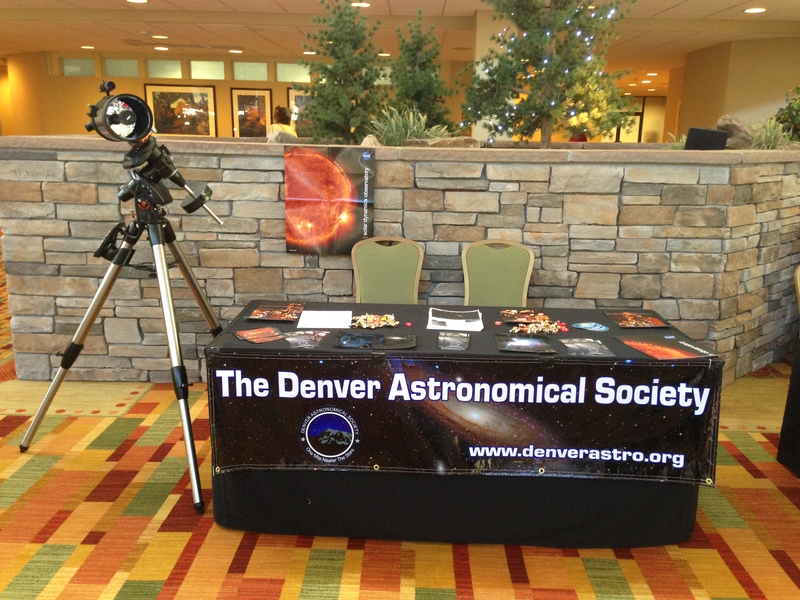 I’m a member of the Denver Astronomical Society now, and took the lead to get us a table at AnomalyCon (a Steampunk, Doctor Who convention). It’s a smaller convention, about 400-500 attendees over 3 days. In short, this turned out to be very successful outreach event where we gave around 130-150 people a look through a telescope or solar scope. The convention set us up with a table in the artists area that gave us good foot traffic. We decided to setup telescopes Friday evening with the good weather. This was not on the convention schedule, but we had about 50 people including some of the convention and hotel staff came out for telescope viewing that night. We were able to find a section of the parking lot that was reasonable for setting up the scopes and getting good views of Jupiter, Orion, and Mars as it rose later in the evening. One of our members also setup his scope with a solar filter during the day on Saturday for about 3 hours and gave about 40 people a look at some of the sunspots. Saturday night when we were on the schedule for stargazing was unfortunately clouded out, and people were asking about this both at our table and of the convention organizers, so there was clear interest. Sunday we brought out a scope with Solar filter again and counted 43 viewers in about 2 hours before it clouded over. We also conducted a panel presentation where we had about 15 attendees for this despite the fact that it overlapped with the costume contest, which was the premiere event of the evening. Astronomy, with a Doctor Who Twist! Overall, we had a very positive reception at the convention. We handed out a total of about 140 club flyers and encouraged many folks to come visit our regular public night events. We also had organizers from two other conventions approach us about offering observing opportunities at their events. I’m looking forward now to our next convention, StarFest, beginning May 2nd! I thought I would post this here, because I haven’t heard about other astronomy clubs pursuing this opportunity with Comic Cons and Sci-Fi Cons, and it’s a great missed opportunity to reach a wonderfully curious, imaginative, and fun group of people! 3 Responses to "Astronomy Outreach at Comic and Sci-Fi Conventions"
It could be a couple of things. First, are you doing an alignment to begin with? If the telescope computer doesn’t go through an alignment process, it won’t track. It’s also possible that tracking is disabled in the settings – check the manual for how to find the tracking rate setting. The other thing, make sure the scope is getting enough power – try fresh batteries if you are using the internal battery compartment.